The workings of a production steel mill require the on-going support and maintenance of a construction trade specialist contractor. The challenge of working in a steel producing environment demands an understanding of the critical nature of each activity as it relates to their overall mission. Different trade disciplines need to be available and coordinated within the time demands of the owner. Precision is able to succeed in this environment because of the experienced personnel it employs and the support of the local labor unions. While we keep a nucleus of trades people regularly engaged in on-going work, we have also responded with a workforce of 65 laborers and carpenters for a round-the-clock owner required repair of a major production facility. Safety is a primary focus of our work at industrial facilities as it is in all of our operations. However when we work at a steel mill we face additional safety challenges inherent to the plant's operation. As our safety record indicates, Precision's workforce and management is experienced in identifying and overcoming these unique challenges. The projects Precision performs for ArcelorMittal are diverse. They include typical building construction work such as concrete foundations and slabs, base plate grouting, scaffold construction, office remodeling, asbestos pipe insulation abatement. They also include uncommon projects such as construction of a 92 feet tall wood framed quench tower, rehabilitation of refractory linings of furnaces, removal of 4 feet thick 'petrified' mill dust from the roof of a basic oxygen furnace building, and abatement of asbestos containing insulation from the inside of a blast furnace stove. 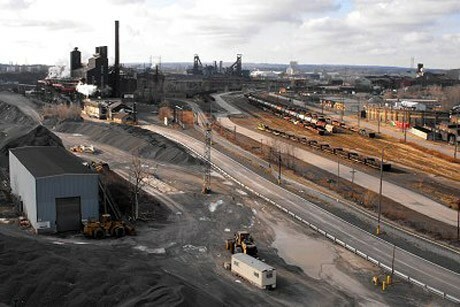 The experience gained over 20 years, combined with the knowledge of our even more seasoned employees has allowed Precision to work at additional ArcelorMittal facilities including Warren, Ohio; Burns Harbor, Indiana; Weirton, West Virginia and for several other industrial owners. General maintenance service, asbestos abatement, and specific labor task assisting in planned and unplanned shutdown of furnaces, cooling towers and general facilities.